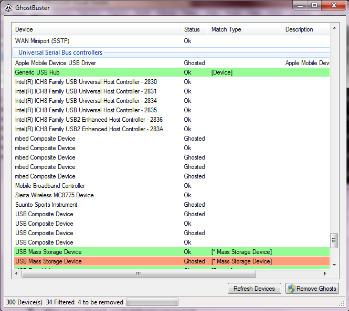 GhostBuster is a powerful tool which will scan your Registry for ghosted devices (hardware which was once connected to your PC, but is no longer present), highlight these and allow you to remove them at a click. Why bother? One reason is to clean up your Registry. There’s really no reason for you to still have a Registry reference for a mouse which you broke and threw away two years ago, for instance – GhostBuster can delete this for you. And the process can also be useful for troubleshooting. When a device isn’t working then sometimes you can have problems getting rid of the old drivers, so that you’ll be prompted to install new versions. GhostBuster may be able to clean away the old references, allowing you to install the latest drivers and hopefully get everything working again. Sometimes your computer might run slower or have low performances for no particular reason. This might be caused, amongst others, due to “ghosted” programs – applications that have installed themselves on your computer when you attached a media device to it and that continue to run even if their corresponding device is no longer connected. By default, Windows does not show “ghosted” devices, so it is hard to manually find and uninstall them, since you do not even know what processes slow you down or where they are located on your disk drive. GhostBuster is a handy utility that allows you to see and terminate any running but inactive applications. It will detect all the drives that are currently running and warn you if any of those is started, but not working due to missing device connection. The program can help you see all the devices that are installed on your computer. You can view a device’s properties, such as description, hardware ID, configuration, class GUID and manufacturer. You can add each drive to a class or device category, or you can create your own classification using the wildcard option. GhostBuster helps you remove any “ghost” devices easily. You can remove all the detected “ghosts”, or only those that have been categorized. The application gives you the option to create a system restore point, so any accidental removal can be easily recovered. GhostBuster keeps your system clean and running at full performance by removing any drivers that no longer need to function. You will be able to run your computer at maximum capacity and your operating system will not crash for unknown errors and malfunctions.